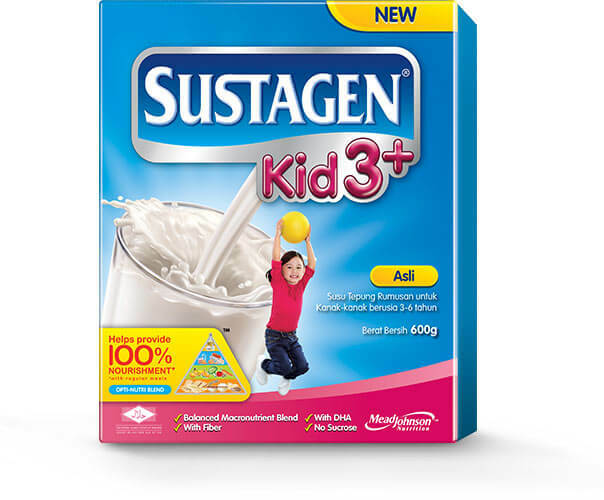 Sustagen Kid 3+ is a nutritious milk scientifically formulated by Mead Johnson for children aged 3 to 6 years old. It contains important nutrients found in the 5 Food Groups from the Food Pyramid^, and has DHA. Important nutrients found in Food Groups from the Food Pyramid^. DHA: is found abundantly in the brain. Fiber (Inulin): helps increase intestinal Bifidobacteria and help maintain a good intestinal environment. Protein, calcium, iron and other nutrients and vitamins. Sustagen meets at least 80% of Malaysian Recommended Nutrient Intakes (RNI). Sustagen Kid 3+ is loved by children for its delicious taste too! 4 delicious variants available! Choose your child's favourite variant today! Give your child Sustagen everyday as a part of balanced diet to help him get 100% Nourishment*. Ensure all feeding utensils are washed and sterilized thoroughly before preparation. Use scoop in the box to measure powder. Store dry scoop in pack. Feeding Guidelines: 3 feedings per day. To maintain freshness, store Sustagen in a clean, cool and dry place before and after opening. After opening, fold and clip the cut section. Keep pack in a clean, dry and air tight container to ensure freshness. Use content within 1 month after first opening. Do not use if aluminium pack is torn or punctured. If reconstituted milk is not consumed immediately, keep in a refrigerator and use within 24 hours after mixing. Do not freeze powder and avoid prolonged storage at excessive temperature. When it is time for your child to change his or her milk formula to Sustagen Junior 1+, doing the changeover properly is very important. The changeover should be made slowly and gradually, taking approximately 1-2 weeks and should be only be done when the child is in good health. If you have any changeover problems, please consult your child’s doctor.